3 Tudor Rose01263 715779work01603 870304fax Self-cateringA spacious first floor apartment with both lift and stairs access. Comfortable, light and airy, and so very convenient for Hunstanton town and its beautiful beach. Enjoy evening walks along the clifftops admiring the stunning sunsets that this part of the North Norfolk coast is renowned for. 3 Tudor Rose offers weekly bookings starting on Saturday. A spacious first floor apartment with both lift and stairs access. 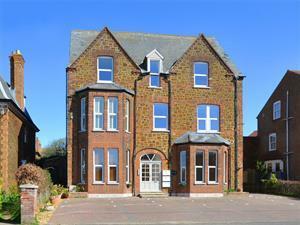 Comfortable, light and airy, and so very convenient for Hunstanton town and its beautiful beach. Enjoy evening walks along the clifftops admiring the stunning sunsets that this part of the North Norfolk coast is renowned for.